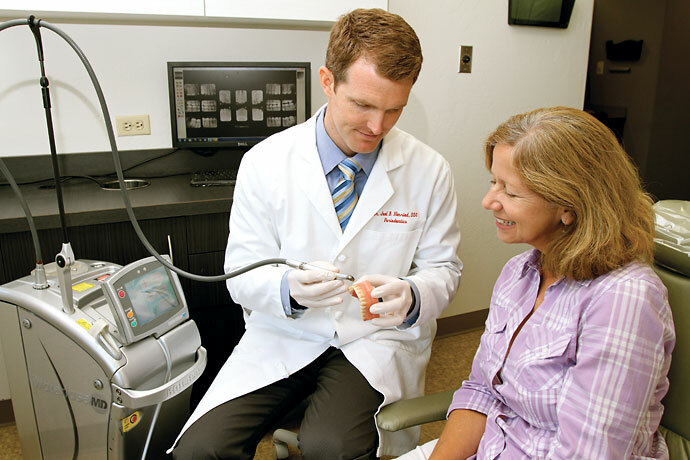 Lasers make treating gum disease more comfortable with faster healing times. A minimally invasive alternative to Gum Surgery! LANAP (Laser-Assisted New Attachment Procedure) is an FDA approved safe and effective method of treating gum disease. 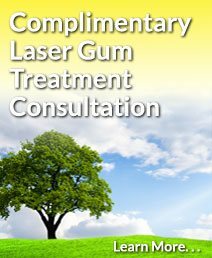 The LANAP procedure utilizes a soft tissue laser to gently remove diseased gum tissue without harming healthy gum tissue. Healing time with LANAP is also much quicker than non-laser methods of treating gum disease. LANAP takes two 2-hour visits, or a longer session where sedation may be suggested; and two follow up visits, whereas scalpel surgery requires four sessions of about an hour apiece, plus more visits for suture removal and additional check-ups. Rather than weeks, recovery time with LANAP is very fast, and most patients may only need to use an over-the-counter pain reliever for any discomfort for one or two days. The PerioLase system used in treating gum disease makes the entire procedure more efficient. Safe for patients with health concerns such as diabetes, HIV, hemophilia, or those taking medications such as Plavix or aspirin. Dr. Henriod will perform a complimentary oral exam to see if you’re a candidate for LANAP. You’ll get an opportunity to discuss concerns, have treatment options explained and get any questions answered. If needed, he’ll take digital x-rays of your mouth so he can make a diagnosis and discover the extent of the gum disease. When you return for your first LANAP® Procedure treatment, you’ll get a local anesthetic to eliminate any discomfort. LANAP® Procedure is much less traumatic then conventional surgery, but if desired sedation can be used for a comfortable appointment. Dr. Henriod uses a soft tissue laser with a fiber about the thickness of three hairs. This is inserted between your teeth and gums and is used to eliminate bacteria and diseased gum tissue. Healthy gum tissue is not harmed in the process. Once this is done, Dr. Henriod will use an ultrasonic scaler and special hand instruments to remove tartar from root surfaces. 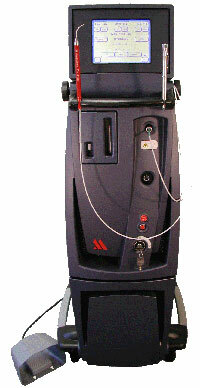 Lastly, the laser is used to finish cleaning the gum pocket and aids in sealing the pocket so new germs cannot enter. The gum heals, re-attaching to the clean surface of the tooth root. The procedure is quick. It takes just two 2-hour sessions, or you have the option to have it all done in one treatment. 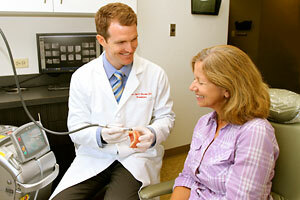 Both the 2-hour sessions, and full mouth treatment options are tailored to each patient’s needs. Most people return to work the next day.